Prior to evaluating the performance of the drives in a NAS environment, we wanted to check up on the best-case performance of the drives by connecting them directly to a SATA 6 Gbps port. 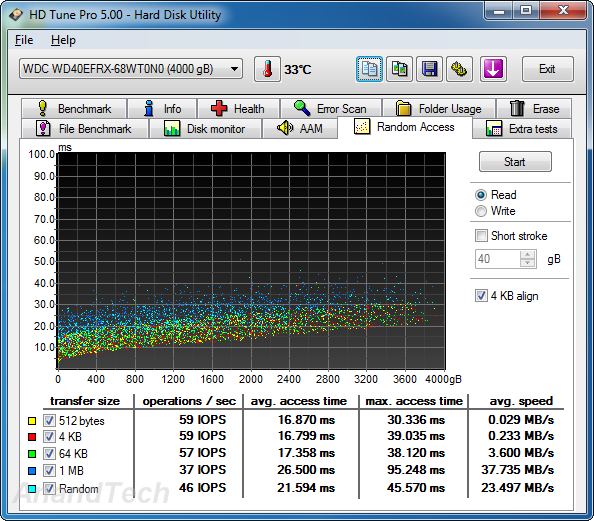 Using HD Tune Pro 5.0, we ran a number of tests on the raw drives. The following screenshots present the results for the various drives in an easy-to-compare manner. 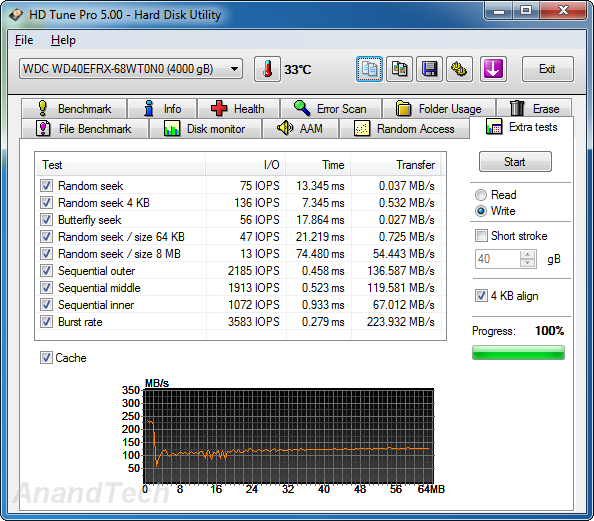 The WD Se and WD Re drives, as expected, lead the benchmark numbers with an average transfer rate of around 136 MBps. The Seagate unit (135 MBps) performs better than the WD Red (111 MBps) in terms of raw data transfer rates, thanks to the higher rotational speed. However, the burst rate of the Seagate NAS HDD is much lower than that of the WD Red. This is probably because the DDR2 memory used in the WD drives is clocked higher than the one in the NAS HDD. A similar scenario plays out in the sequential write benchmarks. The WD Re leads the pack with an average transfer rate of 135 MBps and the WD Se follows close behind at 133 MBps. The WD Red comes in at 108 MBps and the Seagate NAS HDD clocks in at 131 MBps. The on-board cache in the WD series is faster than that on the Seagate unit, leading to better burst rates. In the random read benchmarks, the WD Red and Seagate NAS HDD perform fairly similar to each other in terms of IOPS as well as average access time. The WD Re edges out the WD Se despite similar rotational speeds and platter structure. The differences between the enterprise-class drives and the consumer / SOHO NAS drives is even more pronounced in the random write benchmark numbers. 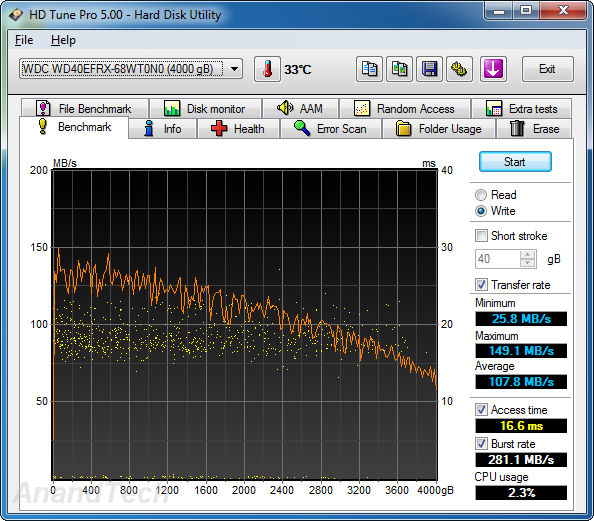 The Seagate NAS HDD loses out in terms of both IOPS and average access time to the WD Red. WD Re and WD Se perform much better in this scenario. HD Tune Pro also includes a suite of miscellaneous tests such as random seeks and sequential accesses in different segments of the hard disk platters. The numbers above show the WD Red and Seagate NAS HDD matched much more evenly with the NAS HDD emerging slightly better in quite a few of the tests. The cache effects are also visible in the final graph. Similar to the previous sub-section, we find that the WD Red edges out the Seagate NAS HDD in the 4KB random seek test, but loses out in a majority of the other tests which are heavily influenced by the rotational speed. We now have an idea of the standalone performance of the four drives being considered today. In the next section, we will take a look at the performance of these drives when placed inside a typical SOHO / consumer NAS.